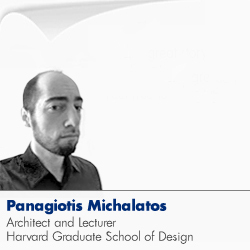 Panagiotis Michalatos is an architect registered in Greece and UK. He holds an MSc in applied IT from Chalmers Technical University in Sweden. He is currently working as a computational design researcher for the London based structural engineering firm AKT. While in AKT along with colleague Sawako Kaijima they provided consultancy and developed computational solutions for a range of high profile projects by architecture practices such as ZHA, Thomas Heatherwick, Fosters and partners, Future systems and others. Their work, in the development of computational design as a quasi-discipline in-between disciplines has been published and presented in international conferences. They have also developed a range of software applications for the intuitive and creative use of structural engineering methods in design. Panagioti’s work in iteraction design and digital media has resulted in a long collaboration with Stockholm based contemporary dance production company CCAP, most recently for the performance “cut-outs and trees” that was shown in Venice dance Biennale 2010.